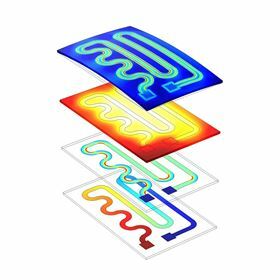 COMSOL, Inc., a leading global provider of engineering simulation software, today announced the release of COMSOL Multiphysics® 4.4, the latest version of its powerful platform for the modeling and simulation of electrical, mechanical, fluid, and chemical applications. A ribbon design has been introduced to the COMSOL Desktop® environment, when run on Windows® platforms, to provide easier navigation and an enhanced user experience. By grouping commands and displaying them as needed, the ribbon makes it easier to find and use the tools available to let you get your work done faster. Commands are grouped and ordered according to the main modeling tasks, which are themselves grouped under dedicated tabs for definitions, geometry, physics, mesh, study, and results. The COMSOL Desktop brings several additional workflow improvements, such as a one-click select feature that enables faster selections in the graphics window. Using this feature, users can now hover over a boundary or domain to highlight it, and then select it with a single click. Another noteworthy feature is the new auto-complete search function, which allows you to quickly find the postprocessing variables you need among the many that are created when working with multiphysics models. The new Mixer Module, an add-on to the CFD Module, was designed specifically for the analysis of stirred mixers and reactors used in the manufacturing of pharmaceuticals, food, fine chemical, and consumer products. With its dedicated features for simulating mixer and impeller designs, as well as concentrations, velocities, and temperature profiles, the Mixer Module is ideal for accurately modeling a variety of industrial processes. The Mixer Module expands on the rotating machinery capabilities of the CFD Module by providing features for the simulation of turbulent and laminar flow, Newtonian and non-Newtonian fluids, free surfaces, non-isothermal flow, and reacting flow. The Mixer Module provides results on a number of quantities specific to mixing, such as mixing efficiency, power draw, and the impeller pumping number. Geometry and Mesh – Core functionality enhancements include new geometry subsequences for user-defined geometric primitives, if/else statements in the model tree for geometry creation, and mesh export to NASTRAN® file formats. Mechanical and Acoustics – The Structural Mechanics Module now provides easy access to rotordynamic forces and includes a new fast penalty method for contact. Joints with friction and three new joint types have been added to the Multibody Dynamics Module, while new evaluation methods for nonlinear materials and thermal fatigue are now included in the Fatigue Module. The Acoustics Module now offers aeroacoustics simulations based on the linearized Euler equations, enabling better simulations of noise in jet engines, mufflers, and gas flow meters. Heat Transfer – The Heat Transfer Module now includes two fast and memory efficient methods for modeling radiation in participating media, the thermoelectric effect, and heating in biological tissues. Fluid – Surface wall roughness for turbulent flow and a more efficient outlet boundary condition have been added to the CFD Module. Mass and energy conservation for laminar flow is greatly enhanced thanks to updated flow formulations. Electrical – The AC/DC Module now contains a nonlinear magnetic material library. A new feature in the RF Module enables the simulation of components with ports on interior boundaries. The Wave Optics Module now includes scattering with a Gaussian background field and Laser Heating interface. The Semiconductor Module has been enhanced with many updates, including heterojunctions and tools for impact ionization. Multipurpose – The Optimization Module is now expanded with a new gradient-based method for topology optimization, and a gradient-free method for geometric dimensional optimization. Particle-field and fluid-particle interactions can now be easily modeled in the Particle Tracing Module using a new efficient method. Interfacing – User-defined selections can now be synchronized in LiveLink™ for SolidWorks® and material selections and material names can be synchronized within LiveLink™ for Inventor®. The ECAD Import Module now enables multiphysics simulations using the ODB format for printed circuit board (PCB) designs. COMSOL provides simulation software for product design and research to technical enterprises, research labs, and universities through 18 offices and a distributor network throughout the world. Its flagship product, COMSOL Multiphysics®, is a software environment for modeling and simulating any physics-based system. A particular strength is its ability to account for coupled or multiphysics phenomena. Add-on products expand the simulation platform for electrical, mechanical, fluid flow, and chemical applications. Interfacing tools enable the integration of COMSOL Multiphysics® simulation with all major technical computing and CAD tools on the CAE market. This story is reprinted from material from COMSOL, Inc., with editorial changes made by Materials Today. The views expressed in this article do not necessarily represent those of Elsevier. Desktop Metal has appointed Jeffrey Immelt, former chairman and CEO of GE, to Desktop Metal’s board of directors.